At our November meeting we heard from Kees Frederiks, Residential Cycle Parking Co-ordinator at Lambeth Council about an exciting new initiative the Council is undertaking to bring on street secure cycle parking to Lambeth. In the style of the times it is hoped that it will be run on a ‘co-operative’ basis with local management of the facilities coming from residents working together on a street. Kees writes ”Lambeth council is leading the way in providing secure bike parking on its streets for use by residents. 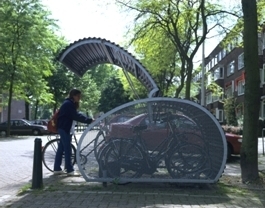 The council plans to replace selected car parking spaces in the borough with Dutch-made Fietshangars (Bicycle Boxes), such as that pictured. Thousands of these secure units have already been successfully installed in cities in Holland over the past decade, and a few lucky Lambeth residents are likely to be able to hire a secure bike space for as little as £5 per month in the New Year. If you are interested in getting involved or want to know more please contact Kees Frederiks on Kfrederiks@lambeth.gov.uk or 020 7926 6241. We in Lambeth Cyclists support this great initiative which will bring secure cycle parking to the borough and will be working with the Council to ensure its success.